A Brisbane-based editor and creative communicator who loves free weekends, when they happen! Visit me at ellwords.com.au or bookswordspages.wordpress.com. If your bath was overflowing and flooding the floor, would you go get a mop? Or would you turn off the tap first? It's obvious, isn't it. Yet why, when we're drowning in waste materials and excess rubbish, do we try to deal with the rubbish instead of 'turning off the tap' that delivers it all? It seems impossible to act differently. But it can be done, and Biome's Zero Waste workshop will show you how. 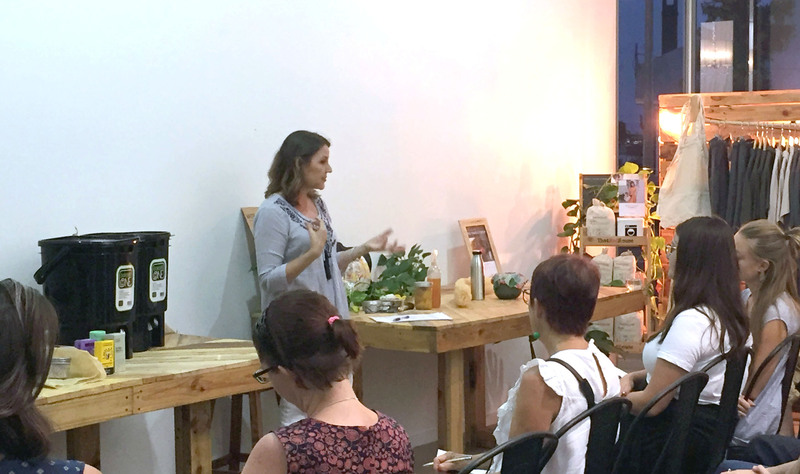 I recently had the privilege of attending Zero Waste at the Biome Collective in Paddington and came away with more anti-waste strategies than I could ever have imagined by myself. Facilitated by Biome founder Tracey Bailey and Biome Collective coordinator Jacq Driscoll, the workshop runs through the seven Rs of creating a no-waste lifestyle and helps you shift your thinking away from our consumption-focused practices. Wait - seven Rs? You probably already know 'reduce, reuse, recycle' - but as Tracey and Jacq will show you, once you've put a few other Rs in place, the waste you have left to deal with will be unbelievably minimal! In the pleasant location that is the Biome Collective, next to the Paddington store, Tracey outlined these Rs in a sequence that will help you minimise your part in our waste problem. You see, it's not just about recycling the rubbish we produce: if you reduce (there's an R word!) your consumption of commercial products, you'll also reduce the pressure on the finite resources needed to make and distribute them. So, making for yourself many of the things you need is a big step in the right direction. But how? The workshop is presentation-style, but with attendees asking questions and sharing their own tips and experiences, my session was highly interactive. I now have a long list of reusing and recycling websites (more Rs!) to add to Biome's tips, thanks to my fellow attendees. There was real community among those present, all concerned enough to have come along but all at various points along the no-waste road. If you've joined the War on Waste, or have at least let yourself see what's going on and become concerned about it, I highly recommend Biome's Zero Waste workshop to support you on your journey. Take along a pen and notebook - I filled pages with tips, quotes and ideas! - and also a lidded jar for taking away a no-waste laundry product. The Zero Waste workshop is scheduled regularly - watch the Biome workshop webpage for the next session. *Lee Ellwood was a guest.